Samuel Hoffman | The Journal Gazette Max Landis of IPFW drives on Ian Theisen of South Dakota State, 1st half, Thursday. In IPFW practices, there is a role called "The Dog," and the player who fills that role wears a green jersey. "He’s a guy that’s going to refuse to lose," first-year Mastodons coach Jon Coffman said. "He doesn’t have to be a talking leader, but he’s our leader on the floor." Three weeks ago, senior swingman Joe Edwards raised his hand to volunteer to be "The Dog." "I’ve been begging and pleading and barking at our guys to get a pack of dogs," Coffman said. "We need more of those guys." This week, before IPFW’s impressive 84-74 home win over South Dakota State on Thursday, Max Landis and Steve Forbes joined Edwards in "The Dog" role. "On their own, without me coaxing them, you have Max and Steve pick up a green jersey and put them on with Edwards," Coffman said. "It’s no surprise to me those guys have a phenomenal game (against the Jackrabbits)." 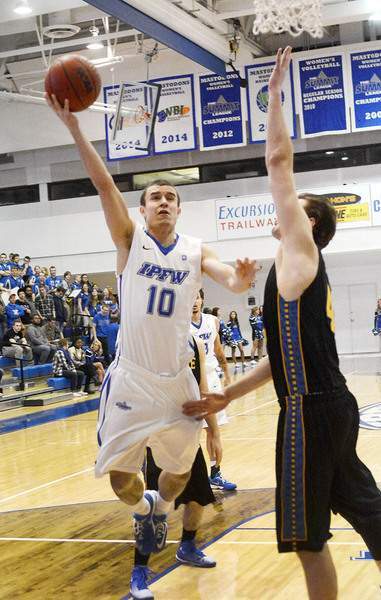 Landis had 19 points Thursday, his most in an IPFW uniform since transferring from Gardner-Webb. "Max is an unbelievable guy: great energy all the time, one of the hardest workers on the team," Mastodons guard Isaiah McCray said. "You have to love Max, the excitement that he brings. He’s a wonderful guy to play with. I look at him as a brother on and off the court. What more can you say about him?" McCray said Landis has been a big boost since his minutes were extended three weeks ago. Over the past four games, Landis is averaging 36.8 minutes and 13 points. "He’s going to continue to play great for us," McCray said. "We’re going to continue to find him, so he can knock down open shots." That process is much more fluid when Forbes establishes himself inside early in games, as he did en route to 23 points against South Dakota State. "Every time I have a big game I thank my teammates," Forbes said. "They’re looking for me. We play inside-out basketball. I’m real unselfish. I could care less if I score 23 points as long as we win." The Mastodons (12-11, 5-5 Summit League) hope to continue the lift they received from Landis and Forbes when Oral Roberts (13-10, 6-3) visits the Gates Sports Center tonight. IPFW lost the first meeting with the Golden Eagles, 62-58, on the road Jan. 17. "I don’t know if it’s necessarily the momentum," Coffman said. "We have some confidence now. That goes to making shots. I think that will help us against Oral Roberts." Coffman believes practices with "The Dogs" – now plural – also will prepare IPFW for the Golden Eagles. "They’re going to put different pressures on us than South Dakota State," Coffman said. "They have two of the best guards in our league, a really good center. We’ll lock in on Oral Roberts, but I promise you, our guys are going to come with energy, no matter what happens."